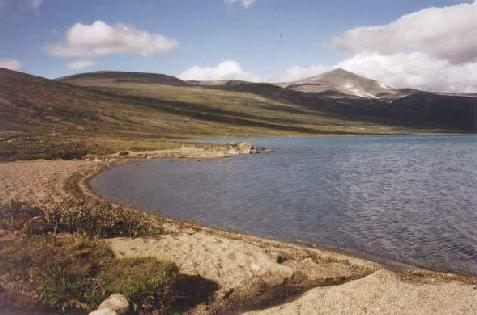 Backpacking in the Jotunheim National Park, Norway, 1997 - Day 4: River crossings and Reindeer. 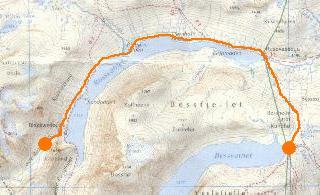 Previous: Day 3: Besshø, Bandet and Veslefjellet. Index Next: Day 5: Surtningssua. Day 4: River crossings and Reindeer. A pleasant day's walk along Russvatnet to a new campsite in øvre Russglopet. The only slight snag was a shortcut along the lake side which involved a couple of intrepid river crossings. I suppose that we British aren't used to the way that in glacial areas rivers are at their highest in the Summer. Anyway to cross the Blåtjørnåa I had to break off a couple dead tree branches to use as poles and wade up to mid-thigh through the rather chilly water. Next time I'll follow the path! In the evening I had my first encounter with reindeer as a huge herd - certainly hundreds, maybe a thousand - wandered down the valley past my tent. A line of reindeer wander down the valley. Total for the day:16km, 200m.